It has been exactly one year since we started this blog on Blooger, after having originally started up on LiveJournal. Between November 30, 2007 and November 30, 2008, we've had almost 30,000 visitors to our website. We thank everyone who has contributed to the relative success of this website. Bill Noble should be back in jail for his contemptuous violation of the terms of his parole. As regular readers of this website are well aware of, Noble was convicted of violating Section 319(2) of the Criminal Code and was sentenced to 4 months in prison. He was released two months later with strict conditions that he not access the Internet for a period of no less than 3 years. 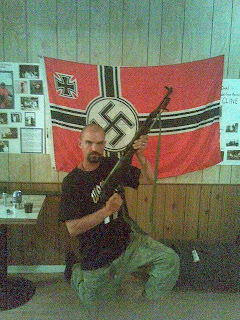 Almost immediately upon his release, Noble violated the terms of his parole by participating on Facebook, Stormfront, and running the hate website and forum for the Aryan Guard. Some time ago, an American neo-Nazi named William (Bill) White called for the murder of Richard Warman owing to Mr. Warman's active campaign against racism in Canada. White published Warman's home address and place of work. He suggested methods by which an individual could kill Mr. Warman in the most graphic manner possible. Warman filed a complaint about White's website, Overthrow.com, with the CRTC. Unfortunately, the CRTC claimed they couldn't do anything because White and his website were both based in the United States and beyond the reach of their mandate (evidently blocking a website advocating the murder of a Canadian citizen didn't occur to them). White thought he was untouchable and acted accordingly. However, chickens came home to roost in October 2008 when White was arrested on federal charges by the FBI. According to news reports and court papers, White's arrest was based primarily on recent online threats against a member of the jury that convicted the Creativity Movement's leader Matt Hale off incitement to murder. Additional information in court papers indicate that White's arrest was also based on an article suggesting the assassination of president-elect Barak Obama, as well as threats made towards a certain Canadian lawyer in Ontario (see pages 10 and 11 of 24). National Post Apologizes to Richard Warman. Again. On November 10th, the National Post posted on its Full Comment Web blog a column entitled “Ezra Levant: Canada’s free speech enemies to lay Remembrance Day wreath,” which included a link to another Web site that suggested lawyer and human rights activist Richard Warman had posted an offensive item on the Freedomsite website about Senator Anne Cools. The National Post has no evidence to support this allegation against Mr. Warman and it hereby retracts any suggestion that Mr. Warman manufactured any statement about Senator Cools. The National Post apologizes for any embarrassment this has caused Mr. Warman. Why would you even (re)print his stuff? He's become a "libel liability". If you reproduce any of his articles, make sure to go through them with a fine-toothed comb and edit it down to the bare bones. Indeed. One would think that, given their current troubles in this matter, that the "journalists" with the National Post would be more careful. Richard Moon issued his report on the Canadian Human Rights Commission and he advocated that section 13 of the Canadian Human Rights Act should be repealed. We're not going to go into the entire report deeply, but if you're interested in a good analysis go to BigCityLib's blog. As we know that the racist right is fond of all things German (at least German of a certain era in history involving goosestepping and bad moustaches), we'd like to introduce them to a word that often defines our member's attitudes towards the trials and tribulations of the racist right. Those of us who participate in gathering information and writing articles for Anti-Racism Canada have been very busy this month, though our business is more a matter of our rather full and hectic lives than anything the far right are up to. November has been filled with hockey practices and piano lessons for our children, vacations to Spain, and getting marks ready for midterm report cards. It helps that the activities of the far right have been pretty low key too. So, we thought we'd write a short blurb about what has been happening over the last couple of weeks. Cue the conspiracy accusations. If our readers would like to know more about the trials and troubles of Terry Tremaine, they can go to a well researched article found on the website of our friends with the One Peoples' Project. A little over a week ago, the Conservative Party of Canada held a policy convention in Winnipeg. The convention marked a significant shift to the right and will no doubt be fodder for those who believe that Harper and the Conservatives have a secret agenda. From our stand point, one of the most interesting motions was to remove power from the Canadian Human Rights Commission and Tribunal. Recently some prominent conservatives have found themselves in the cross hairs of the Tribunal for comments made about Muslims and Islam. We find it interesting it was only some of their own were targeted that conservatives started calling for more freedom of speech. One of the biggest cheerleaders of this motion, which ultimately passed almost with unanimity, was Paul Fromm who called on his supporters to write Conservative MPs to push for defanging the Commission and Tribunal. Fromm is no stranger to the Tribunal, as he has advocated for a number of individuals who had been brought before the Tribunal based on complaints by Richard Warman. We will charitably state that Fromm's efforts before the Tribunal have met with limited success. Any Vandalism Involving Broken Windows in Calgary Recently? Gee, we wonder how that happened? I'm writing to you with concerns over the use of your discussion forum services by the Canadian neo-Nazi group called "the Aryan Guard". 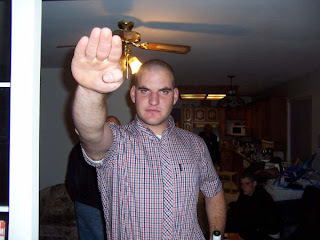 I believe that the Aryan Guard is in violation of the following sections of your Terms of Service 1) Indecent Images & Links (due to their use of swastikas and other hate symbols); 3) Topics & Material (due to their clearly white supremacist and neo-Nazi oriented discussions); and 4) Legal Use (although I am not aware of a breach of U.K. or U.S. laws, there are clear violations of Canadian human rights legislation, including s. 13 of the Canadian Human Rights Act, and potentially of s. 319 of the Criminal Code of Canada). I trust that you will take swift and proper action to prevent this hate group from further using your services. Please do not hesitate to contact me with any questions. Thank you. First we'd like to forward our readers to an article on the blog "Firebrand" which discusses how the right-wing mainstream media in Canada have abandoned any pretense of journalistic integrity in their effort to re-brand Paul Fromm as a "civil liberty advocate." Thank you to the person who forwarded to us this link. We are gonna find you. And give you a reward for being the world's dumbest person. Grow up kid. You live off of basic Marxist propaganda. You post things about "Neo Nazi's" attempting to be someone. But really you spend most of your time on a computer probably in your mothers basement. And spewing nonsense to onepeoplesproject. Actually kind of sad. You need to get a life. Yesterday, we reached 20,000 views. The previous article on the Aryan Guard focused on the infighting between members and those who have abandoned the racist gang. 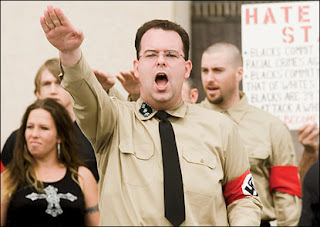 The final article of this three part series will feature the criminal behaviour of the Aryan Guard. 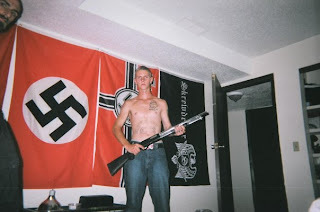 As we have reported in the past on this blog, members of the Aryan Guard are no strangers to the criminal justice system. 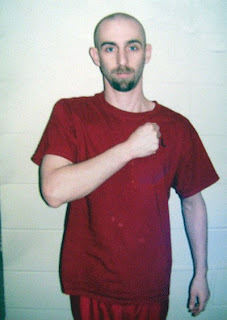 Thomas Trenerry has spent time in prison on criminal charges and had his sentenced increased as a result of a prison escape. 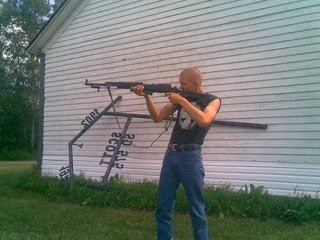 Kyle McKee and Dallas Price have criminal convictions and were both implicated in an assault using weapons in 2006. Later that year, Robert Reitmeier was charged with attempted murder in the case of a beating which left a man in his 40s unconscious (we don’t know if the man survived the attack or if he remains in a coma, though charges against Reitmeier appear to have been stayed). R.N was convicted of various crimes early this past year and appears to either be on probation. One of the founders of the Aryan Guard, a person who’s name is Jan Korinth and who posts online as “boywhite” was arrested and placed in the Calgary Remand Centre not long after he moved from BC to Calgary. After some efforts to try and make bail for his release, the Aryan Guard has failed to mention Jan’s name since and his current fate and whereabouts is currently unknown.